The beauty of Scotland has blown my breath away…Scotland is a Land of breathtaking natural beauty…as well as man-made wonders. You just can’t look at the the various Castles, monuments strewn all over of Edinburgh, The Highlands and the Lowlands and not wonder at the absolute marvel of it all. 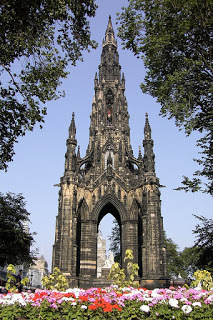 One of the Monuments that interested me in particular was that of Scott Monument, which is located at the end of the Eastern side of the Princess Street in Edinburgh. This Monument is dedicated to Sir Walter Scott whom we were informed by the local tour guide, that he was very popular in the culture of Scotland, and so a monument was decided to be built and erected in his honour. If you look at this picture of the Scott Monument, then maybe many wouldn’t appreciate it and it’s looks wouldn’t appeal to many people’s aesthetic sense, as it does look all black & ugly. But for me, this monument held a certain charm in itself..its Majestic splendour towered over the entire city of Edinburgh. I was mesmerized by the beauty of this monument, it was black as soot no doubt about it..but it was Royal. This monument was built in the Victorian Gothic style with Binny sandstone, which has blackened over the years (work started in 1840 and it was opened to the public in 1846)..And as we were further informed, apparently many of the buildings in Edinburgh were blackened by the soot, pollution of the city over the years, and especially so for the Scott Monument, whose Binny sandstone contains a certain amount of oil, which would seep out and combine with the soot and form a layer. While cleaning the monument had been considered and a restoration project took place in the early 1990s to replace bits of the monument which had become damaged, but it was later decided that the process would cause too much damage to the monument and so it has since then been left as it is. I really loved this Gothic structure and my one regret if ever there was, was that due to time restrictions, was not able to visit and climb this historic marvel which towers 200 foot high (287 steps) which leads right to the top and can give a panoramic view of Edinburgh city – The Capital of Scotland. But no fear, I will be back again to Scotland someday and will fulfill my wish !!!!!!! Until then, keep travelling my friends and share your knowledge with others.